Karon Beach Resort has just undergone a refurbishment and has been renamed to Beyond Resort Karon. Please note: With the change this resort is now an ADULTS ONLY RESORT. We had the pleasure of viewing one of the renovated rooms and I must say they look wonderful. The renamed and revamped Beyond Resort Karon is set in the best location directly on the sands of Karon Beach, on the south west coast of Phuket. The resort is situated in a perfect spot, nestled in the corner at the southern end of Karon beach, with stunning ocean views. All that lies between the resort and the beach is a couple of stairs that lead down to the beach from the pool area. The resort is one of just a few beachfront resorts that are available in Karon. Beyond Karon Beach Resort is a medium sized, three storey walk up. Consisting of 78 deluxe oceanfront rooms and 2 suites. All rooms at the resort have balconies overlooking the beach and the pool area. 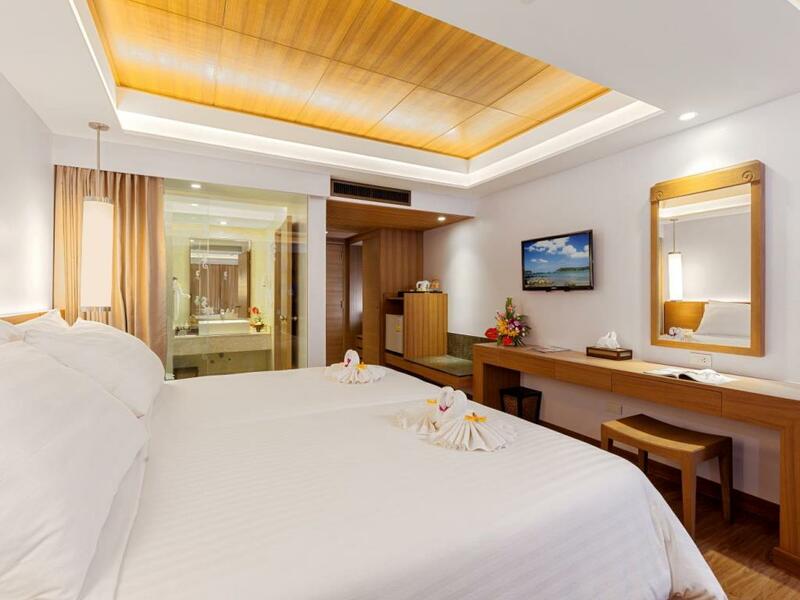 The rooms are fitted with either twin beds or king sized beds, with connecting rooms available on request. The rooms on the ground floor are ideal for families or those wanting direct access to the pool and the beach. 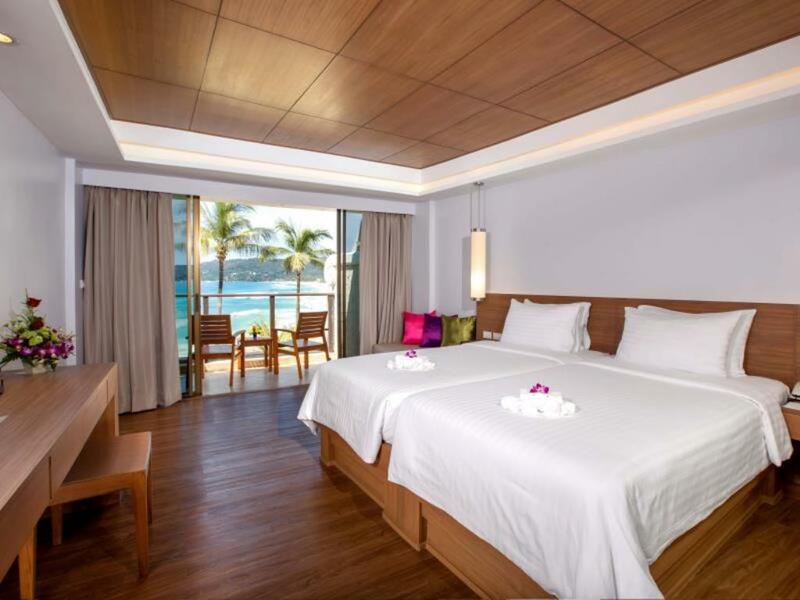 Check out the room rates at this beachfront resort at Karon Beach for your next holiday in Phuket. Room facilities at the resort include air conditioning, a mini bar, tea and coffee making facilities, complimentary bottled water, an in room safe, telephone, bathrobes, hair dryer, satellite TV and WIFi - charges apply. The bathrooms are not large, but do have a nice shower, hand basin and toilet. Beyond Karon Beach Resort has a good range of facilities and services for their guests to enjoy, including two swimming pools which have wonderful views overlooking the beach. The swimming pools are not as big as some resort pools in Phuket, but big enough. The larger pool has a shallow end for the little ones. And the smaller pool has a Jacuzzi and swim up bar, a favorite spot where you can watch the sunset and enjoy happy hour drinks from 5.00 pm – 7.00 pm daily. Other facilities and services include baby sitting, in-house movies, 24 hour reception, baggage storage, laundry and dry cleaning services, parking, car rental room service, cots and rollaway beds are also available. Beyond Karon Beach Resort has a fantastic restaurant called On the Beach Restaurant that has a selection of delicious Thai and international cuisine with spectacular ocean views, and beachside dining. You can relax and enjoy a range of wellness treatments at the Kanda Spa, or treat yourself to a relaxing massage in the massage hut that overlooks the beach. If the beach is to dangerous to go swimming you have the resort pools, but with the feeling of being on the beach. The resort is centrally located and is in walking distance to all the restaurants, bars and shopping of both Kata and Karon. Located just up the hill from the resort is Dino Park Mini Golf , a putt putt course with a dinosaur theme. We have enjoyed fantastic family vacations at this beachfront resort at Karon and would recommend it to other visitors looking for a beachfront location. Since the change of owners Beyond Karon Beach Resort is now an ADULTS ONLY RESORT. We found the staff to be helpful and very friendly, especially the two concierge, who went out of their way to make our stay at the resort extra special. Breakfast was included in our room rate and it was excellent. There was a great selection to choose from including, cereals, tropical fruits, eggs that are made to order, bacon, sausages, baked beans, pastries and more. Get there early to get a table on the balcony as the views are breathtaking. Located right next door to the resort is a money exchange booth and a mini market, ideal for buying extra water, chocolate Hershey bars and cheap alcohol. Close by the resort is a fantastic range of restaurants that serve good, delicious food, at reasonable prices. A couple of our favorites are Ruam Thep Inn which is set directly on the beach. Or just across the road at Kata Villa Steak and Seafood restaurant. On the beach you will find a massage hut that is well worth a visit. A little further down the beach is a beach vendor who rents the sun beds and sells sandwiches, fresh fruit, shakes and cheap beer. For those wanting to learn how to scuba dive Phuket Scuba Club offers a range of different diving courses, many of which are conducted in the waters just in front of Beyond Karon Beach Resort. 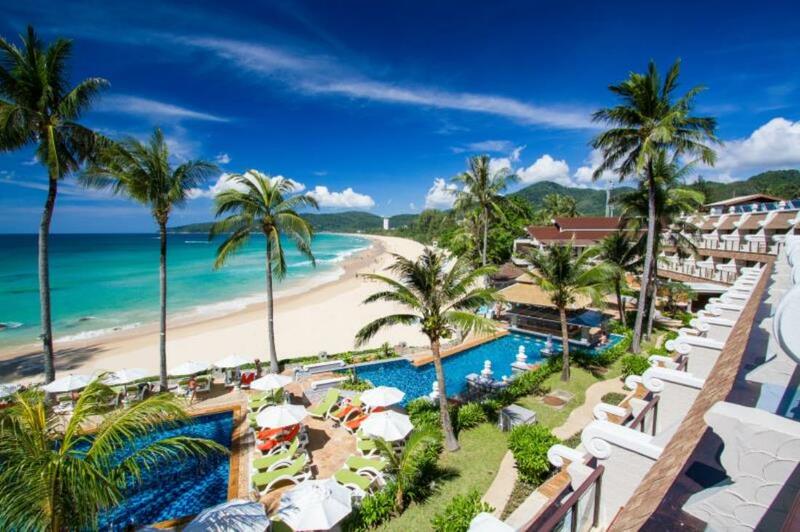 Beyond Karon Beach Resort is a fantastic choice if your looking for an absolute beachfront resort in Phuket. And read other travelers recommendations about this beachfront resort on TripAdvisor.